IPL 2019 Match 25- RR vs CSK where RR looks much struggling in form and CSK to be in full spirit and topping the game. Rajasthan Royals and Chennai Super Kings look totally in contrast in the points table where CSk is crashing the table with 10 points in hand and scoring five of the victories in six of the matches RR have scored only one win in their court. Thus it will be a struggle for Royals to play against CSK and have to peel off their skins to perform in front of home crowd. This match will be hosted by Royals in Sawai Mansingh Stadium, Jaipur at 8:00 PM (IST). The crowd is in full support of their home team but welcomes the opponent with full love and support. This pitch is highly affected by the dew factor and as per today’s weather forecast it would be 31 to 34 Celsius degree in the afternoon while as the evening gradually arrives humidity will increase which be a huge factor on the performance of the spinners RR have some of the good spinners in their playing XI while CSK will have to struggle in that field. Batting in the second place can play a vital role in chasing the target and win the match. This pitch has been in favor of batting second. Both teams are to off same playing XI with a little change for the game not because of the injury but for better results. While Sanju Samson missed playing in last two matches and is expected to be fit by now. 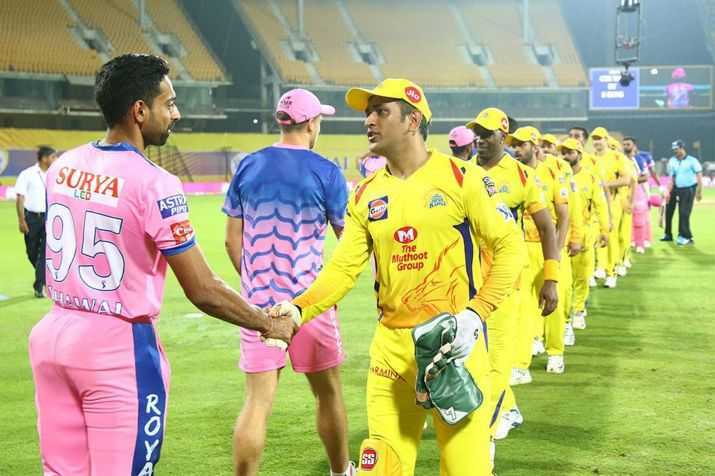 Both the teams have been against each other for 21 times where CSK have 13 wins in hand and RR with 8 wins. This match is in home ground of RR and they have won most of the matches here. So might be they can have a win today too. Royals might be slaying the match for handing over the batting chance to Mahipal Lomror in place of Sudhesan Midhun. Their batting line up looks in a fair amount of depth. While CSK will also be opening with Sam Billings instead of Shane Watson just to make Shane a little relaxed. Otherwise, team XI is good to go. From the previous facts and records with the team performance and winning rate the yellow army with smashing 1st position in VIVO IPL season 2019 point table looks to be more in the win. RR with winless matches and scoring lowest grounds on points table will struggle to catch CSK temperament and players in front of their home crowd.